Happy Friday! It’s January 11 and I’m Lit Daily editor Jenna Greene, here with your Daily Dicta. Reach me at jgreene@alm.com or on Twitter @jgreenejenna. It’s time to crown 2019’s first Litigator of the Week. Nominees included Goodwin Procter IP partner Neel Chatterjee, who won summary judgment on behalf of TV data company Alphonso Inc. in a patent dispute with Samba. Their battle over IP rights for targeted advertising is likely to shape the future of TV data analytics. And Williams & Connolly’s Kannon Shanmugam scored at the U.S. Supreme Court for Danaher Corp. in a case that confirmed courts must enforce contracts that delegate threshold arbitrability questions to an arbitrator, rather than a court. 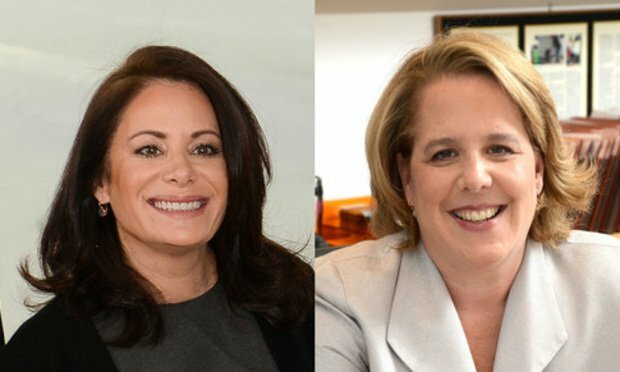 But for our winner, we went with the power duo of Roberta (“Robbie”) Kaplan of Kaplan, Hecker & Fink (below, right) and Sharon Nelles of Sullivan & Cromwell. The longtime friends teamed up to represent Airbnb in challenging an ordinance by the City of New York that could, as U.S. District Judge Paul Engelmayer of the Southern District of New York noted, have proven “an existential threat” for their client. On January 3, they persuaded the judge to enjoin the ordinance based on a novel Fourth Amendment theory—one with significant implications for the protection of consumer information in the digital age. They discussed the case with Lit Daily. Lit Daily: Who is your client and what was at stake? Robbie Kaplan: We represent Airbnb, Inc., a client that I have been fortunate to represent for many years. The law we challenged was intended to do irreparable damage to Airbnb’s business in New York City, which is one of Airbnb’s most significant markets, by forcing Airbnb to produce massive amounts of private business records to city officers with no procedural or privacy protections. Important constitutional rights were at stake here. And we vindicated the basic principle that the United States Constitution protects the rights of all Americans, whether private citizens like Edie Windsor or companies like Airbnb. What is Local Law 146, and how would it impact Airbnb? Sharon Nelles: The New York City Council passed Local Law 146 last summer, and it was due to go into effect just a few weeks from now. If Judge Englemeyer had not enjoined the law, Airbnb and other homesharing platforms would have had to turn over essentially all of their records about every single listing in New York City, every single month, including sensitive personal information about Airbnb hosts, when they are in their homes, and how they use their homes. If you think about it in terms of a traditional business, the overreach is plain. The government could never pass a law requiring a company to turn over all of its paper records without legal process or review. The ordinance here requires no probable cause or legal process and provides for no review, and it contains no safeguards to protect the security or privacy of the data it requires homesharing platforms to turn over. Robbie Kaplan: In an Orwellian twist, the ordinance even requires homesharing platforms to tell their users that the mere use of the platform will constitute “consent” to this compelled disclosure—although, even if a user does not consent, the ordinance requires the platform to hand over their personal data anyway. In his opinion, Judge Engelmayer calculated that the potential penalty for non-compliance would have been either about $360 million or more than $1 billion in 2016, depending on how the term “listing” was defined, an issue about which the city was strikingly inconsistent at oral argument. I gather you two go way back as friends and colleagues. How did you coordinate your work as co-counsel in this case? Robbie Kaplan: Sharon is one of my closest friends. As best we can recall, we met years ago in connection with our representation of the credit rating agencies—Sharon represents Moody’s and I represent Fitch. As a result, coordination here was super easy. Sharon and I have tremendous admiration and respect for each other, had similar ideas about how to approach this case, and were supported by great teams that worked together seamlessly. Sharon Nelles: It’s been so long, we can’t remember when we met! And I must give a shout out to John Quinn at Kaplan Hecker & Fink, and my colleague John McCarthy here at Sullivan & Cromwell, who made sure we operated as one highly-effective team. Robbie Kaplan: And another shout out to the in-house legal team at Airbnb, which was led by two phenomenal women litigators, Renée Lawson and Alexa Summer. What do you think were some of the strengths that each of you brought to the representation? Sharon Nelles: Robbie and I have been collaborating for years on high-stakes and high-profile cases. Credit crisis, rating agencies, AIG related matters. I represented a group of amici in her incredible win for Edie Windsor. We are currently working together on certain initiatives for TIMES UP. We have a rhythm. It helps that we are both strategic thinkers and we both believe in building common-sense arguments. I don’t think we had a single strategic disagreement. It was always a project of careful building. A back and forth process supported by great teams at our firms and at our client. Robbie’s strength is her deep knowledge of fundamental constitutional principles and her basic fearlessness. Robbie Kaplan: When Airbnb called me about this case, I decided to call one of the best lawyers in NYC to join the team and that was Sharon. Our efforts benefited greatly from the nuance and creativity that Sharon brings to her work. Echoing Sharon’s comments, we and our teams had a shared vision and strategy for how to use the United States Supreme Court’s 2015 decision in City of Los Angeles v. Patel to defeat this ordinance, and ultimately our approach paid off. Gibson, Dunn & Crutcher represented co-plaintiff Homeaway. To what extent did you team up with them as well? Robbie Kaplan: We worked closely with our friends at Gibson, who are great lawyers and colleagues. Sharon Nelles: Very much a part of the team process. The case attracted multiple amici briefs—not typical at the district court level. Why was there such intense interest? Sharon Nelles: Because the ordinance is based on a belief that there is no constitutional infirmity in taking vast swaths of electronic information without process, it really presumes the laws apply differently in the context of a new digital landscape. So, it is no surprise that groups concerned about online privacy and other tech platforms sat up and took notice—and wanted this resolved in the right way, right now. That engagement really speaks to how just troublesome the implications of this ordinance are. As Judge Engelmeyer noted, why not online auctions services, medical providers, credit card companies? The court’s own hypotheticals, and others easily conjured, underscore the far-reaching consequences of the city’s position. In your motion, you led with the Fourth Amendment argument that became the basis on which Judge Engelmayer enjoined the ordinance. What were your key points? Robbie Kaplan: In the 2015 decision in City of Los Angeles v. Patel, the Supreme Court held that a Los Angeles ordinance violated the Fourth Amendment because it required hotels to keep detailed records about their guests’ stays and make those records available to law enforcement upon request without any form of precompliance review. Our argument here was that New York City could not evade this precompliance review requirement by simply requiring companies like Airbnb to turn over huge volumes of sensitive private records every month. As Judge Engelmeyer explained in his opinion, the fact that technology makes it easier to create, store, and transfer private digital records doesn’t mean that those records are any less private. Nor does it make the Fourth Amendment any less applicable. If anything, modern technology makes it even more important to respect and enforce basic constitutional principles like those enshrined in the Fourth Amendment. What do you see as some of the wider implications of the decision? Sharon Nelles: This decision addresses application of fundamental Fourth Amendment principles in the digital age. These are bedrock principles that apply to government actors everywhere, not just the City of New York and not just homesharing platforms. As we read in the papers every day, users across all platforms are concerned about the data they share. This ruling makes clear that government actors cannot do a wholesale invasion of the privacy of tech companies or their users in the guise of regulation. Is this a battle that’s likely to be repeated in other localities? Robbie Kaplan: Other municipalities regulate homesharing platforms in sensible ways and in collaboration with Airbnb and other companies. Our hope is that this decision will encourage cities to pursue sensible regulation rather than ignoring privacy rights altogether, as New York City tried to do here. For more from Kaplan and Nelles, check out this podcast with ALM’s The Careerist Vivia Chen. Federal trial and appellate courts are grappling ever more with requests from U.S. government agencies to postpone cases. The case featured a familiar cast of lawyers: Elizabeth Cabraser of San Francisco’s Lieff Cabraser Heimann & Bernstein for the plaintiffs and Robert Giuffra Jr. of Sullivan & Cromwell for the defense. U.S. District Judge William Orrick III found that a former nonequity shareholder of national labor and employment firm Ogletree, Deakins, Nash, Smoak & Stewart is bound by the firm's arbitration agreement after she failed to opt out of it. Atlanta libel lawyer L. Lin Wood notched a settlement against one television network and a preliminary win against another over TV specials featuring unsolved crimes—cases that he said should serve as a warning to other media companies. Seyfarth Shaw said its 2019 Workplace Class Action Litigation Report is its largest edition ever, with attorneys analyzing a record 1,453 class action rulings in state and federal courts. A heterosexual woman claimed sexual orientation discrimination after she was fired over her Facebook post that disparaged a transgender individual. Or maybe because she was just a jerk. The era of ultra-cheap live-in childcare is over. Copyright © 2019 ALM Media Properties, LLC.